FIFPro, the world players' union for footballers, and FIFA, football's governing body, have announced the 55-man shortlist for the World XI, world football's team of the year. Jerome Boateng, Mats Hummels, Toni Kroos, Philipp Lahm, Thomas Müller, and Manuel Neuer are all on the shortlist for the award. With six nominees, Germany is tied Brazil for the second-most nominees from one country. Spain tops the list with 11 nominees. Kroos, Lahm and Neuer were all part of the 2014 World XI and are the only German players ever to be included in the team. Lahm and Neuer appeared in the squad each of the last two years. Bundesliga players have a significant representation as well, laying claim to twelve nominations. Bayern Munich's David Alaba, Xabi Alonso, Douglas Costa, Robert Lewandowski, Arjen Robben, Thiago Alcantara and Arturo Vidal are part of the shortlist with Boateng, Hummels, Lahm, Müller and Neuer. The Bundesliga has the second most nominees. It trails La Liga, which has 23 in total. 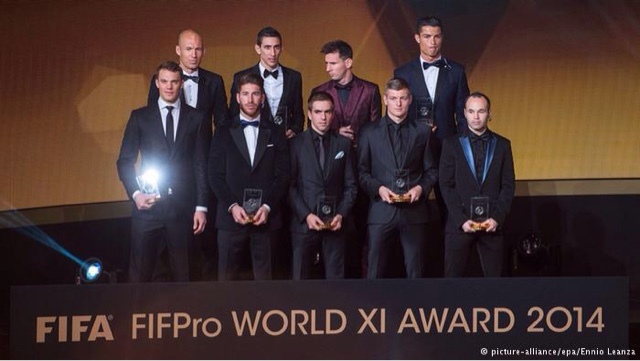 FIFA and FIFPro will announce their World XI at the Ballon d'Or ceremony on January 11 in Zurich, Switzerland.